Students boarded the buses to Point Peron with excitement and adventure on their minds and that was what they found. The three day camp was filled with activities from the beginning of the day until the end. Students were challenged in four major activities of stand-up paddle boarding, low ropes course, team games and snorkeling. Fairbridge leaders demonstrated the skills needed for each activity and away the students went. Students were amazingly fast and agile getting up on the paddleboards and were treated on several occasions to visiting dolphins only a few meters away from them. It was an amazing sight to see! Those snorkeling in the water saw different types of octopi and lots of different fish. If there was no time limit, I’m sure some of them would still be there. The low ropes course challenged students to work as a team and to communicate to each other. This meant less talking, more listening and a whole lot of trust. These communication skills were also needed for the team games as they tried to get a ball into a bucket and go through a beanbag minefield. 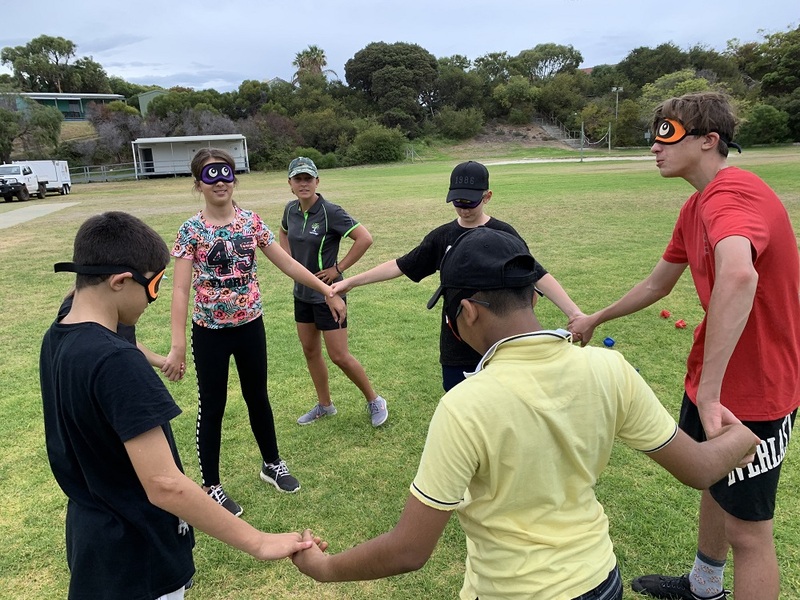 One of the favourite games was “gladiator”, were students met at a crossroad and could knock each other off – teachers were not exempt and there was a lot of fun! During the day students were fed and fed and fed. The meals were fabulous and plenty of it. (Chocolate mousse seems to be a hit). Students were also fed by Kate, our Chaplain, who shared what gratitude and thankfulness meant in a variety of ways. Students were thoughtful in their responses and year 8s had a great reflective time on the last day underneath a grove of willow trees. On the last day students were separated back into year groups and they commenced helping people in the community. Working alongside People Who Care, students cleared and raked out backyards and front yards. They did the work so well they filled 14 bags at one house and 8 bags at the next house. Students worked together so well that they finished earlier than expected. Extra highlights were playing capture the flag, were students ran all over the camp site with an energy that could light the whole country, playing basketball, chilling out with friends, sock game, sheriff, the loudest game of paper, scissors rock and building marine creature sand castles at the foreshore. The success of the camp was due to students and their willingness to participate and push themselves in some of the challenging parts. It’s also due to the great staff who gave up their time to plan, prepare and get involved in all aspects of the camp. A big thank you to Mr Pleysier, Mr Chapman, Kate Wheatley and Mrs Wheat.